Santa Claus rally? No Santa Claus rally? Naughty or nice? One thing is for sure the last two weeks on Wall Street have been gut wrenching. Not for the faint of heart. During that time, the major U.S. stock indexes have suffered losses that put them on track for their worst December performance since the Great Depression. Investors have also been gripped by volatile swings in the market as they grapple with a host of issues. The S&P 500 has logged six moves of more than 1 percent over the period, three of which were of more than 2 percent. For context, the broad index posted just eight 1 percent moves in all of 2017. The Dow Jones Industrial Average, meanwhile, has seen seven days of moves greater than 1 percent. Its intraday points ranges also widely expanded. The 30-stock index has swung at least 548 points in eight of its past nine sessions, and also posted its first single-day 1,000-point gain ever on Wednesday. The index ended down 76 points Friday after vacillating throughout the session. These moves are remarkable and what has been equally remarkable has been the fact that many pundits and astute market veterans haven’t had much of a satisfying explanation; fears of the Fed after Chairman Jerome Powell said he did not anticipate the central bank changing its strategy for trimming its massive balance sheet, a U.S. federal government shutdown, disfunction in Washington (almost every part of Trump's life is now under investigation), slowing global growth, weaker data coming out of the U.S., “end of cycle”, and thus fears of a recession. All of which seem convincing as a root cause of this vicious selling. Watching CNBC has been almost comical with pundits like Jim Cramer recommending gold one day only to recommend nibbling on stock as markets move higher the next. 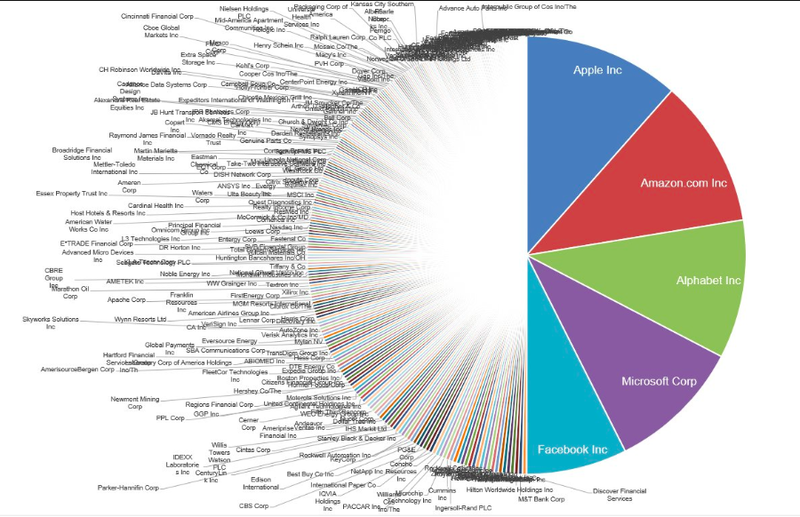 2018 was the year nothing worked: In fact, in 2018, just about every single asset class one can invest in — from stocks around the globe to government debt to corporate bonds to commodities — have posted negative returns or unchanged performance year to date. While any 20 percent sell-off hurts (both the Russell 2000 and Nasdaq led the way into bear market territory. The S&P 500 (-19.8%) and the Dow 30 (-18.8%) did manage to fall just short of the 20% threshold yet the average stock is down far more than that) the one happening now is far from unheard of in terms of depth or velocity. Over the past 100 years, there are almost too many examples to count of stocks tumbling with comparable force. THIS IS INEVITABLE AND NORMAL. WELCOME TO THE STOCK MARKET. Investors over the Holidays have time to reflect on history, now that stocks have avoided a fourth straight down week via the biggest one-day rally since 2009. After coming within a few points of a bear market on Wednesday, the damage in the S&P 500 stands at 15 percent since Sept. 20. This is normal but seems abnormal because we are all talking about it from morning to night. As we are reminded by a recent article in Bloomberg: “A fair amount of complaining has gone on in recent months about the role of high-frequency traders and quantitative funds in the drubbing that reached its peak around Christmas. Perhaps. Those groups are big, and in the search for villains, they make easy targets. Treasury Secretary Steven Mnuchin is among the people who have made the connection. 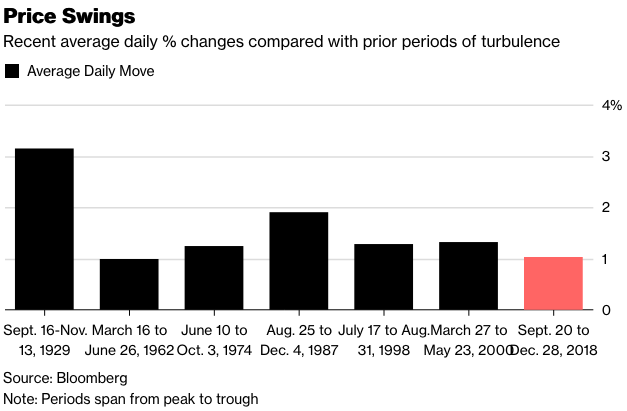 This pattern holds for the Dot-com Bust (S&P 500 lost 35 percent over the course of two months), Black Monday of 1987 (S&P 500 rose 36 percent between January and August 1987 in what was set to be the best year in almost three decades. Then the October sell-off pushed the S&P into a 31 percent correction over just 15 days), 1974 Sell-Off (the S&P 500 saw the index fall 33 percent in 115 days as a weakening economy, rising unemployment and spiking inflation pushed investors to head for the exits. Stocks subsequently rebounded, surging more than 50 percent between October 1974 and July 1975), 1962 Rout (S&P 500 Index lost a quarter of its value between March and June 1962), Not so Fat ‘57 (20 percent correction over 99 days in 1957). The selling is likely overdone. When the SP 500 peaked in late September '18, the forward 4 quarter estimate was $168.72; today, that same estimate is $169.58. The point is with the S&P 500 index falling some 15%, the forward estimate on which it's valued is actually slightly higher. The question is will these estimates hold. Clearly the stock market is not so sure despite the fact that the U.S. economy is in a good position to sustain a 2.5-3 percent growth rate in 2019. With the selling frenzy pushing stock prices lower, investors are now pricing in zero growth in earnings for 2019. Is this reasonable? 2018 earnings will come in at around $162 for the year. Clearly, the market has lost a lot of confidence in the staying power of earnings and the health of the economy. If we apply a conservative 14-15 multiple to that, it yields a range for the S&P at 2,268-2,430. So with the index closing at 2,488 Friday, we are just above that range. The issue is that the stock market generally overshoots in either direction when it sees change. Emotion takes over and causes the rapid move. Despite existing negativity, the market’s valuation has changed for the better. 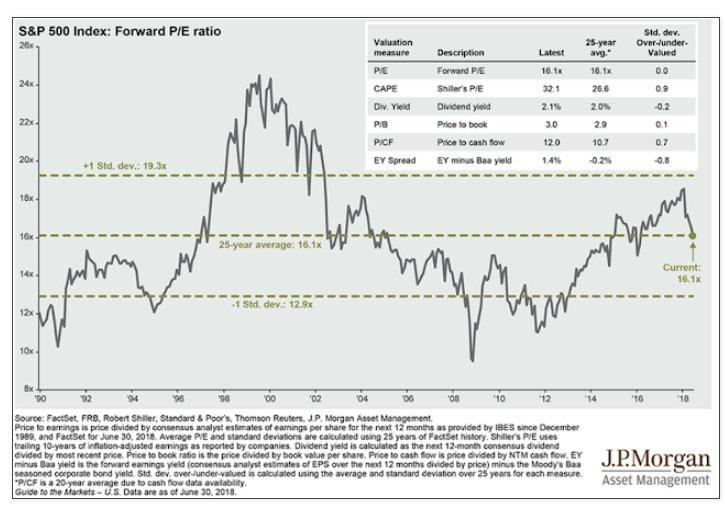 The S&P 500 is actually heading into 2019 with a P/E ratio right in line with its historical average going back to 1929. And if you look just at the last 30 years going back to 1990, it is actually undervalued. 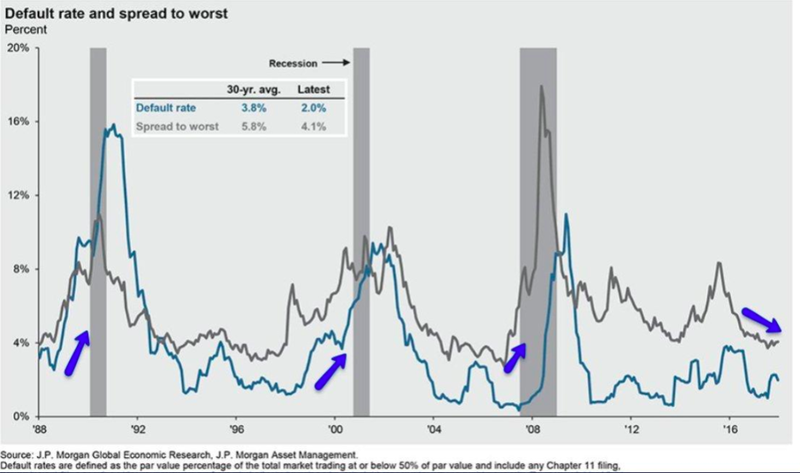 Unless one sees another financial crisis upon us (which at this time we do not), the probability is high that this could also mark a near term low. As for investor sentiment, bearishness sits at record highs. In fact, half of individual investors now describe themselves as “bearish” for the first time since 2013. The latest AAII Sentiment Survey shows greater polarization, with neutral sentiment falling to an eight-year low. In the past 28 years, there have been 2 times when every stock in the 2&P 500 Energy sector was below their 10-, 50-, and 200 day average and more than half were trading at 52 week lows. The pendulum of the market may be set for a swing in the other direction. Cerner Corp. (CERN:NASDAQ): major player in the healthcare IT industry as its software is highly integrated into the operations of several large provider networks. The firm has internally developed much of its software, which makes its product lineup close to seamless and effective within the healthcare IT sector. The secular demand tailwinds for Cerner’s products are robust given ACA mandates that require providers to upgrade their health records management systems. This highly positive trend will be enhanced over the next several years by changing payer reimbursement structures. Trading at a roughly 30% discount to intrinsic value (earnings based DCF), 10 year low P/E, P/S and P/FCF. CGI Group Inc. (GIB.A:TSX): deeply embedded in government agencies across North America and Europe. Gained greater scale with its acquisition of Logica in 2012. This scale will allow the firm to better meet the needs of global clients. The firm has a backlog of signed contracts of more than CAD 21 billion, with an average duration of approximately five to seven years. Growing IT complexity is expected to support long-term demand for IT services as companies look to simplify and streamline their IT landscape. Trading at a roughly 20% discount to intrinsic value (earnings based DCF), attractive 10 year low P/E, PEG ratio and EV/EBIT. I began reading a fantastic book over the break which I highly recommend entitled “The Laws of Human Nature” by Robert Greene. The book takes as its fundamental premise that we humans tend to think of our behaviour as largely conscious and willed. To imagine that we are not always in control of what we do is a frightening thought, but in fact is the reality. We live on the surface, reacting emotionally to what people say and do. We settle for the easiest and most convenient story to tell ourselves. These principles are all the more relevant in light of 2018’s market action. What is interesting is that like this sell off (including the cryptocurrencies sell off), when we look back at other selloffs like that of 2008, most explanations emphasize our helplessness. We were tricked by greedy banking insiders, mortgage lenders, poor government oversight, computer models and algorithmic traders etc. What is often not acknowledged is the basic irrationality that drove these millions of buyers and sellers up and down the line. They became infected with the lure of easy money. The taste of wealth and the envy of their fellow market participants appearing to make effortless gains. This made even the most rational, experienced and educated investor emotional. Hungry for his own slice of the action. Ideas were rounded up to fortify such behaviour such as “this is game changing technology, this time it is different and housing prices never go down”. A wave of unbridled optimism takes hold of the mind and panic sets in as reality clashes with the story most people have accepted. Once “smart people” start looking like idiots, fingers begin to get pointed at outside forces to deflect the real sources of the madness. THIS IS NOTHING NEW. IT IS AS OLD AS THE HUMAN RACE. Understand: Bubbles/corrections/bear markets “occur because of the intense emotional pull they have on people, which overwhelm any reasoning powers an individual mind might possess. They stimulate our natural tendencies toward greed, easy money, quick results and loss aversion." It is hard to see other people making money and not want to join in. It is also equally hard to watch one’s assets drop in value day after day. THERE IS NO REGULATORY FORCE ON THE PLANET THAT CAN CONTROL HUMAN NATURE. As demonstrated above, the occurrence of these selloffs will continue as they have until our fundamental human nature is altered or managed. 2018: The Year of the Woeful World Leader. Trump, May, Macron, Merkel. Italy, Spain, Sweden, Latvia. Even the dictators stumbled. So much bad governing, so little time. What the Fall of the Roman Republic can teach us about America. The bad news is that the coming decades are unlikely to afford us many moments of calm and tranquillity. For though four generations stand between Tiberius Gracchus’ violent death and Augustus’ rapid ascent to plenipotentiary power, the intervening century was one of virtually incessant fear and chaos. If the central analogy that animates “Mortal Republic” is correct, the current challenge to America’s political system is likely to persist long after its present occupant has left the White House. Low fertility rates aren’t a cause for worry. AI, migration, and being healthier in old age mean that countries don’t need to rely on new births to keep growing economically. Start-Ups aren’t cool anymore. A lack of personal savings, competition from abroad, and the threat of another economic downturn make it harder for Millennials to thrive as entrepreneurs. This McKinsey study of 300 companies reveals what every business needs to know about design for 2019. In a sweeping study of 2 million pieces of financial data and 100,000 design actions over five years, McKinsey finds that design-led companies had 32% more revenue and 56% higher total returns to shareholders compared with other companies. What do we actually know about the risks of screen time and digital social media? Some tentative links are in place, but many crucial details are fuzzy. U.S. stocks steadied Friday after a three-day slide, while Treasury yields and the dollar edged lower. The week was largely dominated by crude’s tumble into bear market territory yet all three major American assets didn’t seem to care. The S&P 500 Index finished the week virtually where it began, as rallies in health-care and tech shares offset a rout in energy producers. Small caps rallied Friday to end higher on the week. Also of interest this week was Warren Buffet’s Berkshire Hathaway Inc., buying a 38 percent stake in Home Capital for about C$400 million ($300 million) and providing a C$2 billion credit line to backstop the Toronto-based lender. With the deal, the billionaire investor is wading into a housing market that’s been labeled overvalued and over-leveraged, with home prices in Toronto and Vancouver soaring as household debt hits record levels. Warren Buffett’s deal to back Home Capital Group Inc. was quickly interpreted by Toronto real estate pundits as a vote of confidence for a housing market that everyone from investors to global ratings companies say is a bubble ready to burst. Nevertheless, before getting too jubilant about Canadian real estate one should consider the terms of the deal. 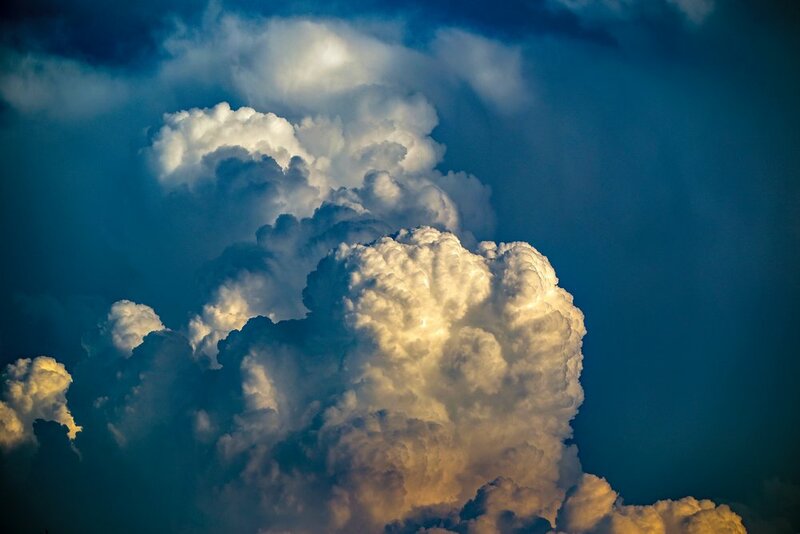 Weakness in energy prices were the theme of the week, yet few signs of contagion emerged leaving everything from gold to the dollar to U.S. equities to stay range bound as the traditionally slow summer season began. As Bloomberg remarked, the bear market in crude in many ways resembles its more severe predecessors from 2014 and 2016: oil prices plummeting, non-U.S. producers floundering to keep supply at bay and concerns swirling around the impact of energy companies on high-yield bonds. The correlation between daily swings in the S&P 500 Index and crude has been roughly zero in the past month, the lowest since January and far below the five-year highs reached in 2016 as the oil prices bottomed near $26 before staging a rebound. Why? Perhaps the industry’s impact on the overall market is simply low. Today, energy stocks account for less than 6 percent of the S&P 500, compared with 11 percent three years ago. Or perhaps investors see little possibility of systemic risk. One thing is evident: that falling energy prices will likely further subdue inflation. Treasury yields have fallen from their 2017 highs recently, with the benchmark 10-year yield trading around 2.15 percent. In March, it traded around 2.6 percent. The bond market doesn't appear to see inflation coming in the near term, and so far it's been right. The consumer price index fell 0.1 percent in May, raising questions about whether the Fed will be able to raise rates once more this year. The next rate hike isn't fully priced in until March 2018, according to the CME Group's FedWatch tool. In addition, Amazon’s CEO Jeff Bezos may be single handedly killing inflation. As recently pointed out on CNBC, at a time when central banks are starting to prepare for an expected rise in inflation ahead, Bezos' move to acquire Whole Foods looks to be a significant counterweight. In addition, this move will likely put greater pressure on other chains such as Target and Wal-Mart to lower prices. Neil Irwin for the NY Times goes so far as to say that the Amazon-Walmart showdown has come to explain the modern economy as in the short term consumers will benefit from lower prices but in the long term will have worrying implications for jobs, wages and inequality. This week I read an interesting piece in the Atlantic which suggested that power causes brain damage. Many leaders actually lose mental capacities - most notably for reading other people - that were essential to their rise. Is it perhaps useful to think of power as a prescription drug which comes with side effects? After 2 decades of lab research, Dacher Keltner, a psychology professor at UC Berkeley, found that subjects under the influence of power acted as if they had suffered a traumatic brain injury—becoming more impulsive, less risk-aware, and, crucially, less adept at seeing things from other people’s point of view. Sukhvinder Obhi, a neuroscientist at McMaster University, in Ontario, recently described something similar. When he put the heads of the powerful and the not-so-powerful under a transcranial-magnetic-stimulation machine, he found that power, in fact, impairs a specific neural process, “mirroring,” that may be a cornerstone of empathy. Which gives a neurological basis to what Keltner has termed the “power paradox”: Once we have power, we lose some of the capacities we needed to gain it in the first place. These findings are concerning as we look to those in our societies who have power including perhaps ourselves. What blind spots has our power generated in ourselves and our leaders? Do these findings help to explain current political events and leadership styles? How much do they contribute to trends in income distribution, social stratification and investment returns? What I found most interesting and perhaps most alarming about these findings is to set them in the context of another ill which society is currently suffering from: an inability to acknowledge error. In a wonderful piece in The Economist a few weeks ago it was posited that humanity is getting worse at owning up to its gaffes. Few enjoy the feeling of being outed for an error but real damage can be caused when the desire to avoid reckoning leads to a refusal to grapple with contrary evidence. People often disregard information that conflicts with their view of the world. Why? Roland Bénabou, of Princeton, and Jean Tirole, of the Toulouse School of Economics posit that: “In many ways, beliefs are like other economic goods. People spend time and resources building them, and derive value from them. Some beliefs are like consumption goods: a passion for conservation can make its owner feel good, and is a public part of his identity, like fashion. Other beliefs provide value by shaping behaviour. These tendencies/biases linked to the desire to avoid acknowledging error are relatively harmless on a small scale but can cause major damage when they are widely shared or exhibited by those in power. It is no wonder that motivated reasoning is a cognitive bias which better-educated people are especially prone. This takes us back to the research on how power can cause the brain to become more impulsive, less risk-aware, and, crucially, less adept at seeing things from other people’s point of views. As investors, but more broadly as humans we would do well to recognize how these tendencies cross-pollinate and threaten to wreak havoc on our decision making and its outcomes. Particularly as we accumulate success and thus power we become more vulnerable. Blinded by our own righteousness, increasingly unable to consider differing narratives, facts, perspectives, ideas and at times even reality. What can be done to avoid these blind spots? Research finds that humility can go a long way to counter such tendencies. Yet to build humility, experiences of powerlessness may be key. By experiencing or at minimum recounting moments of powerlessness, you maintain a connection or “groundedness” in reality. When was the last time you felt powerless? The last time you made an error? Hold onto those moments. They may more important than you think. My algorithm is better than yours. Just 10% of trading is regular stock picking estimates JPMorgan. The majority of equity investors today don't buy or sell stocks based on stock specific fundamentals. No wonder the world’s fastest growing hedge funds are quant funds and robots are eating money managers lunches. Finland tests a new form of welfare. An experiment on the effect of offering the unemployed an unconditional income. Interesting piece in The Economist chronicling Mr Jarvinen who was picked at random from Finland’s unemployed (10% of the workforce) to take part in a two-year pilot study to see how getting a basic income, rather than jobless benefits, might affect incentives in the labour market. He gets €560 ($624) a month unconditionally, so he can add to his earnings without losing any of it. Finland’s national welfare body will not contact him directly before 2019 to record results. I see this happening more often in the developed world. Something to keep an eye on. Stop fooling yourself about 8% returns. Nice piece in Gadfly suggesting that There's an amazing amount of denial going on right now. Investors are simply ignoring current market dynamics and are still expecting average annual returns of 8.6 percent, according to a Legg Mason Inc. survey of income investors released this week. Those who were employed expected more than 9 percent gains, with retirees expecting less. Actual returns have come in markedly lower of late, but hopes remain high. It is important that investors become realistic. If they're not, fund managers will try to serve their hopes and dreams, making the financial system all the more fragile for it. The web makes it harder to read market sentiment. The internet swept away the old-school financial pundits, turning the public forum into the Wild West. Inflammatory click bait filled with extreme opinions has found its way into ordinary discourse. Not too long ago, anyone who held radical opinions about markets, individual stocks (or even politics) could freely opine about them, just as today. But it was local and contained; those with idiosyncratic opinions could only scare their friends and neighbors, one at a time, at backyard BBQs and school plays. That is no longer the case as “crash”, “hyperinflation”, “monetary debasement” are becoming more common than “value investing”, “long-term” and “prudence” ;). The cheapest generation. Why millennials aren’t buying cars or houses and what that means for the economy. Younger generations simply haven’t started spending yet….But what if this assumption is simply wrong? What if Millennials’ aversion to car-buying isn’t a temporary side effect of the recession, but part of a permanent generational shift in tastes and spending habits? It’s a question that applies not only to cars, but to several other traditional categories of big spending—most notably, housing. And its answer has large implications for the future shape of the economy—and for the speed of recovery. After all the old are eating the young. Around the world, a generational divide is worsening. The older we get, the person we spend the most time with is the one we see in the mirror. QZ reports that time with friends, colleagues, siblings, and children diminishes over the course of a lifetime. One doesn’t have to be alone to be lonely. More than half of the lonely respondents in the UCSF study lived with a partner. To feel connected to others, it seems, the number of hours spent on relationships is less important than the quality of the relationship itself.